Everything needed to start and maintain a fine coin collection. 1955-S Lincoln Set. Buy it the easy way--0rder by phone. A true collector's item . .
pieces. Shpg. wt. 4 oz. Same as above. Wt. 3 oz. in. storage box. "Let's Collect Coins"
cents. Shipping wt. lib. 11 oz. body fits into pocket. 1-in. tic magnifier, "What Stamp ls That?" book. 200 different stamps. gauge, tongs, plastic magnifier, 100 world stamps, 121 world flag stamps. 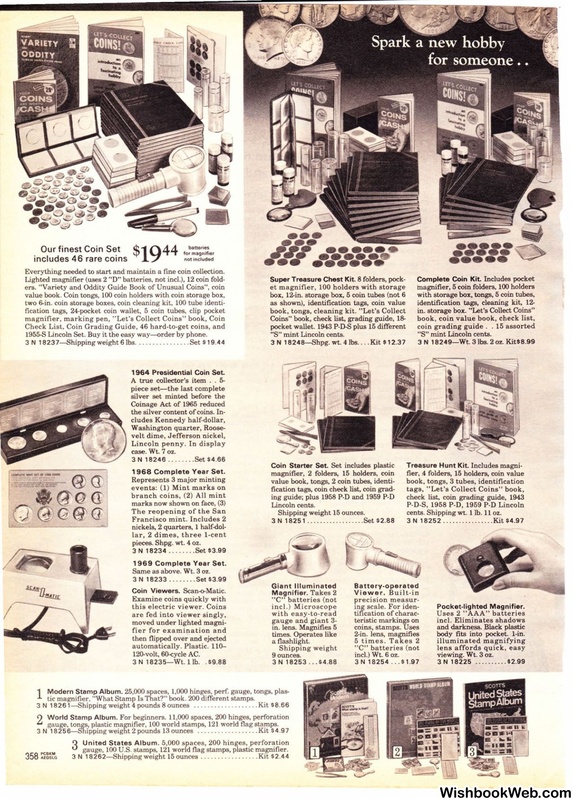 gauge, 100 U.S. stamps, 121 world flag stamps, plastic magnifier. 3 N 18262-Shipping weight 15 ounces . . . . . .